Without a doubt, one of the most essential factors when it comes to conversions is an excellent website design. It might have escaped your notice, but a good web design is integral to an effective marketing strategy. You can adapt as many conversion tactics as you can, but if your web design falls flat, it would be all for naught. Remember that design is your product, so it is that one aspect you should easily neglect. Unfortunately, many web designers make the mistake of creating attractive websites that offer no functionality at all leaving users scratching their heads at the clunky navigation. Unfortunately, creating a web design that is visually pleasing and would achieve usability is not as straightforward as designers hope it would be. An excellent web design is not only one that delivers the most visual coherence but is one that delivers information, builds the brand and is technically sound. However, if you need a more accurate and precise navigation tool, then perhaps taking a gander at the various principles of what makes a good web design will help you make better websites that are not only visually pleasing but are engaging, efficient and easy to use as well. Before anything else, your website should have a purpose. 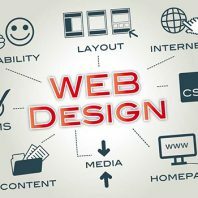 An excellent web design first and foremost caters to the needs of the user, so knowing what these are beforehand would aid you in creating an effective web design. So, what do your web visitors primarily do? Are they there to look for information? Are they looking to transact with your business? Are you advertising a new product? Knowing what your web visitors are doing would determine how your website should interact with your them. The pages of your website should address this and should have a clear purpose. More often than not, people who come across your website would not read every single word you have written there. At the very most, they would only be scanning unless you have written something incredibly riveting enough to maintain their attention or have provided exactly what they were looking for. Knowing this to be the case, it is pivotal that your website should be easy to read and digest. Organize the information you are conveying in your web pages, use subheaders and headlines as much as you can and avoid long-winded paragraphs. Not all fonts are created the same; there are some fonts easier to read than the rest. And then there are some whose usage on the web pages are incredibly frowned upon (Comic Sans, anyone?). Look for fonts that are streamlined and are easy to read against the backdrop of your web pages. Before deciding on a font, compare them and see what works best. Steer clear away from decorative fonts as these will make your website appear unprofessional and childish. Give your websites a bit of a personality by adding a dash of color. Of course, this does not mean that you should just immediately incorporate all of the colors you want. Create a color palette that enhances not only the visual appeal but the user experience as well. Colors should be complementary as they create a balance between the text written and the background. Vibrant colors can be used, but only sparingly as they create emotion and would take away from the professional finish of your website. Nobody wants to be attacked with a barrage of words, so insert as many photos as you can to keep your website interesting and upbeat. Pictures create interest, and in some cases, they maintain the attention of your target web audience so choose them appropriately. Additionally, to maximize the use of information relaying tools, go beyond including photos and incorporate graphics, videos, and infographics. A good website should be easy to navigate, and it should not take your web audience a lot of effort just to get through it. A practical and navigable website should be designed to incorporate designing clickable buttons, and at the very least, it should have a logical page hierarchy. Lead your web audience to various pages of your website by using “breadcrumbs”. Lastly, utilize the three click rule which means that your users should be able what they are looking for within three clicks.